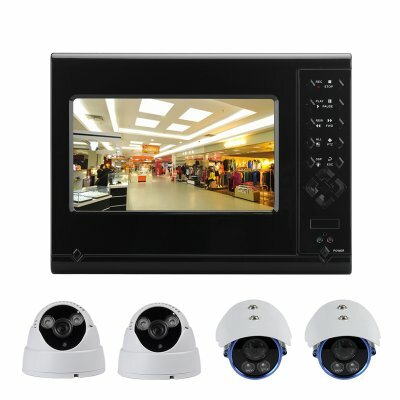 Successfully Added 4 Camera 4 Channel DVR Kit - 7 Inch LCD Display, 2 Indoor Cameras, 2 Outdoor Cameras, Bi-Directional Intercom to your Shopping Cart. This 4 Channel DVR kit comes with everything you need to set up a home or office security system. It includes 4 cameras 2 for indoor and 2 for outdoor use as well as a digital video recorder that features a 7 inch LCD touch screen with 1024x768 resolutions for viewing your security camera feed. Each of the 1/4 inch CMOS cameras has 60 degree viewing angle and 700TVL resolutions. With IR LEDs the cameras can clearly record at night over a distance of 15 meters so you can use them night and day. Included with this package are two 20 meter and two 10 meter BNC cables for connecting the cameras back to the DVR, With H.264 video compression supported and Bi-directional intercom features. Place the 4 cameras strategically round your property coving entranceways and connect up a HDD to the DVR for a fully robust security system. Link it into 4 different cameras to cover the entrances into your property and with HDD support and network client port you can easily store your surveillance or connect this DVR to your local network to view the footage remotely. Using H.264 video compression lets this DVR record footage and store it using a minimal amount of space. The H.264 format is the standard video compression choice for recording, compression, and distribution of high definition video without loss of quality. This 4 Channel DVR can be used in conjunction with 4 security cameras and manual, fixed time, alarm and motion detection recording modes. With a built in Bi-directional intercom it makes a great door security system. This 4 camera 4 channel DVR kit comes with a 12 months warranty. Brought to you by the leader in electronic devices as well as wholesale security cameras and DVRs, Chinavasion..